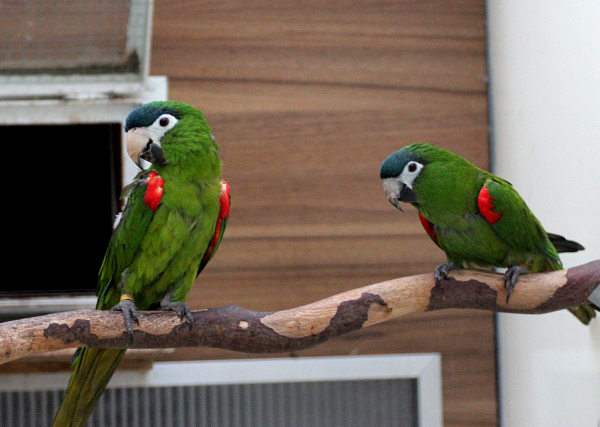 In aviculture, there is a tendency to utilize a single diet for all species, making slight modifications where deemed of utmost importance, such as providing nuts for the largest of the macaws. This concept of parrot feeding tends to provide diets that are either too fatty for birds that easily become obese (such as Galahs or Amazon parrots) or does not provide the high fat requirements needed by some species (namely macaws). The diet often fails to take into account the higher vitamin A and dietary fiber requirements of species like Eclectus. This suggests that one diet—even the parrot pelleted diets so widely used in the USA and becoming more popular overseas with each passing day—cannot provide the dietary needs of all of the seed eating parrots. To achieve optimum health and breeding the aviculturist must be prepared to vary the diet amongst the species in a mixed collection or alternately to specialize in just one group, whose diet is identical. Amazons tend to become obese on a high fat diet. This obesity affects general health and breeding. Their diet should contain minimal amounts of fatty seeds like sunflower and safflower, no nuts, and large amounts of a variety of small seeds. I like some of the commercial cockatiel or conure diets that have minimal amounts of sunflower and safflower or pellets for this group. The seeds or pellets should ideally form no more than 80% of the diet and ideally no more than 60% if only seeds are fed. The rest of their diet should be composed of vegetables and fruits. I always err towards the vegetables, as parrots in the wild consume fruit when it is green and thus low in sugar content. Most modern fruits are packets of sweet, which attract the human palate. This can be confirmed easily by sampling a commercial apple and their original wild ancestor, which will be bitter and astringent. Fruit should make up no more than 10% of the diet. Where available, tropical fruits like guava, mango and papaya should be used over temperate fruits, but if these are unavailable or they are prohibitively expensive then select heirloom fruits that have a lower sugar content. Avoid things like sugarcane, which is basically table sugar in its raw state. Select vegetables that are rich in fibers and betacarotenes. These include pumpkin, sweet potatoes and carrots, which should be steamed to make the betacarotene more nutritionally available. Beets and broccoli are readily eaten but should be steamed. 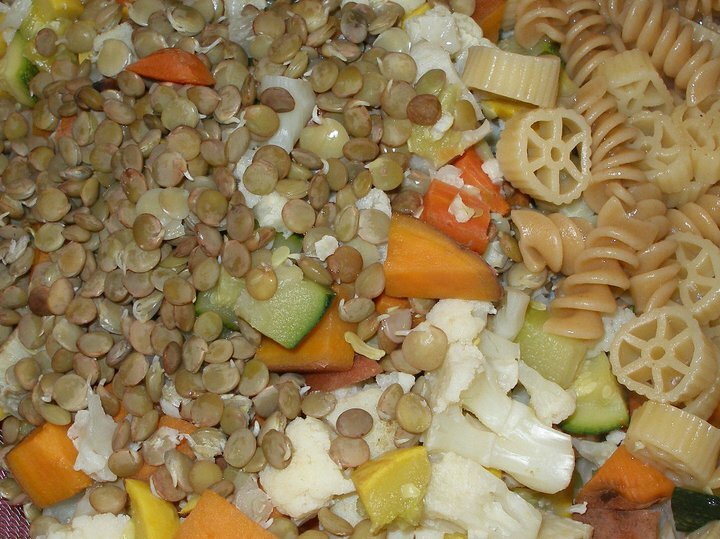 Hot peppers, peas, horse corn (which is not very sweet), courgettes and many other items can be added to the diet. Boiled pulses and germinating seeds are also excellent for these birds. Sunflower and safflower that are germinating convert the fat into energy and thus pose no obesity problem. The only caution with germinating seeds is bacterial growth, which requires thorough cleaning with copious amounts of water and using either GSE (grapefruit seed extract) or apple cider vinegar to deter bacterial blooms in the sprouting grains. Weeds like dandelion and plantain from a pesticide free source are excellent. Spinach is also good but should not be fed more than thrice weekly due to the oxalic acid, which affects calcium uptake. Items like cucumber have virtually no nutrition and should not be fed. 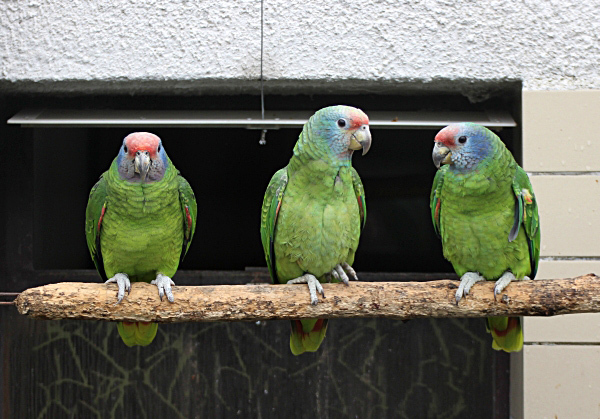 READ Q & A: "Which parrots are better to keep in a group than in pairs?" Macaws and conures share many affinities and can be fed either a pelleted or seed diet. The large macaws especially have a higher fat requirement than the smaller species and conures. Their diet should be supplemented with nuts, possibly fresh coconut if available or small sandwiches of whole grain bread smothered in nut butter. We use the nut butter sandwiches during the time of year when nuts are more difficult to get and to vary the diet. Both groups should also receive vegetables and fruits as for the amazons. We also provide cooked whole grain pasta or brown rice mixed with vegetables and boiled pulses (especially garbanzo and pinto beans). This mash is readily eaten by all parrots but can contribute to obesity in amazons. We try to provide the macaws with 55% pellets, 20% seeds and nuts and the rest a mixture of vegetables, cooked foods and fruit, in that order. The conures get about 70% pellets and the rest of vegetables and fruits, with a weekly treat of processed foods. I do not believe that pellets should be fed as the sole food to any parrot. In addition to the food, we provide copious amounts of enrichment, which includes pods, palm seeds, fresh branches and more to all of the birds. This is important psychologically, enriches the diet and permits the natural foraging behavior to continue in captivity. Oh wow! I would have loved to have been a fly on the wall for that afternoon!! I was so isemesrpd with his integrity and passion for those birds! His writing on his blog is phenomenal, and so engaging. I look forward to going to telegraph hill the next time we are in San Fran!Thanks for your comment!